NEW SALE PRICE: BUY ONE BOTTLE @ $9.99 and get the 2nd BOTTLE @ 50% OFF ($4.99) = $14.99 for TWO BOTTLES! 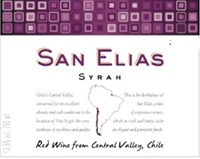 San Elias is a range of outstanding varietal wines produced from a careful grape selection and a very delicate vinification process. The wines are young though very intense, with brilliant and deep colors, very fruity and persistent flavors in the palate. 90% Syrah, 10% Cabernet Sauvignon. 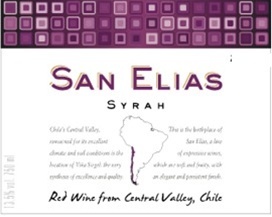 The grapes for this Syrah are selected from vineyards in the Central Valley. The wine presents a deep red ruby color with elegant aromas of plum and blueberry. Juicy and persistent flavors of ripe black fruits and harmonious tannins, along with notes of coffee and smoke. It's hard not to pour another glass of this addicting Syrah. Chicken, pasta, red meats and cheeses.